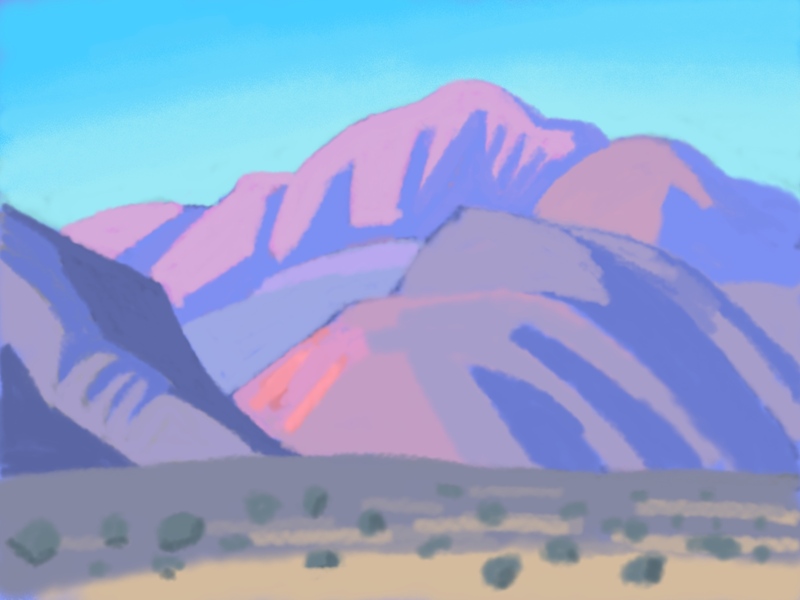 Inspired by David Hockney’s use of the iPad for painting, I bought one, loaded it up with the free app “Brushes” and set to work. 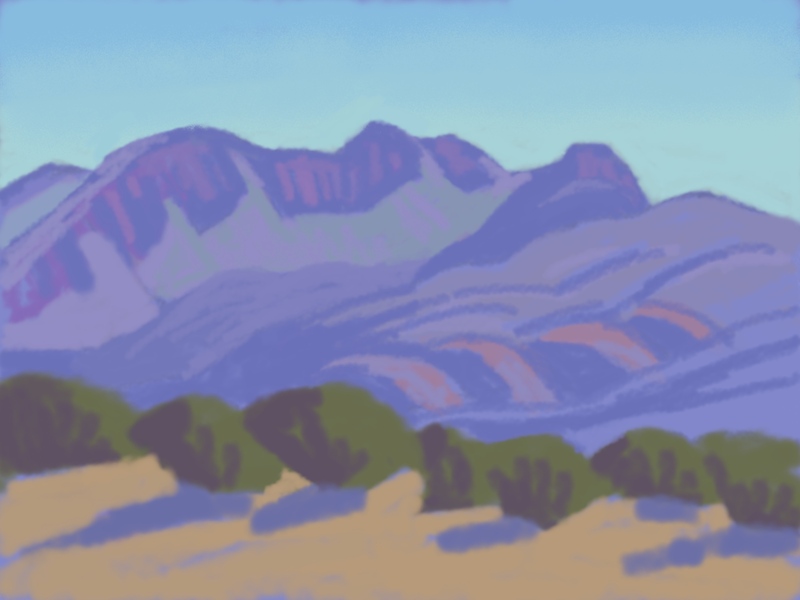 I find that the iPad is just great for en-plein-air colour notes and for generally interacting with the landscape – setting my mind to pause-and-reflect on landforms and colour. 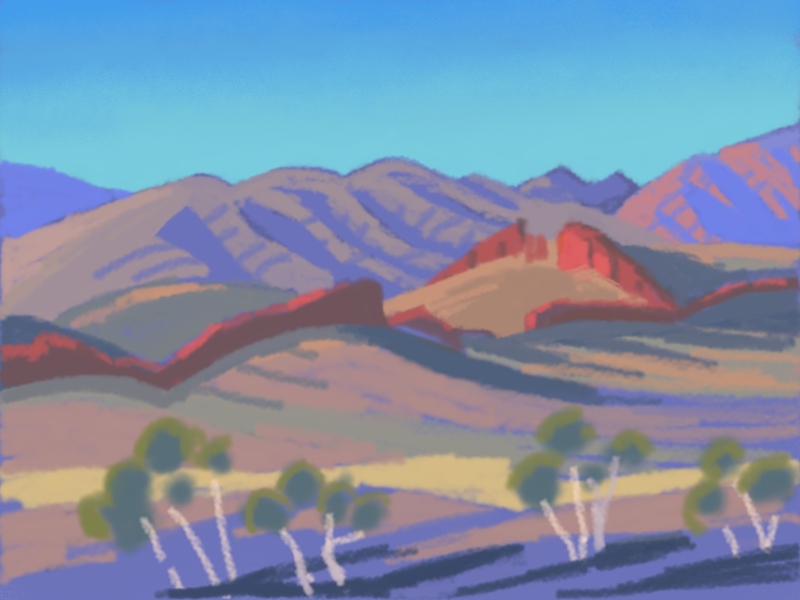 Here are some examples of my iPad paintings done in Central Australia in June of 2015, on a nostalgic re-visit to some of my old painting haunts from the 1970s-80s. My last visit had been in 1993. 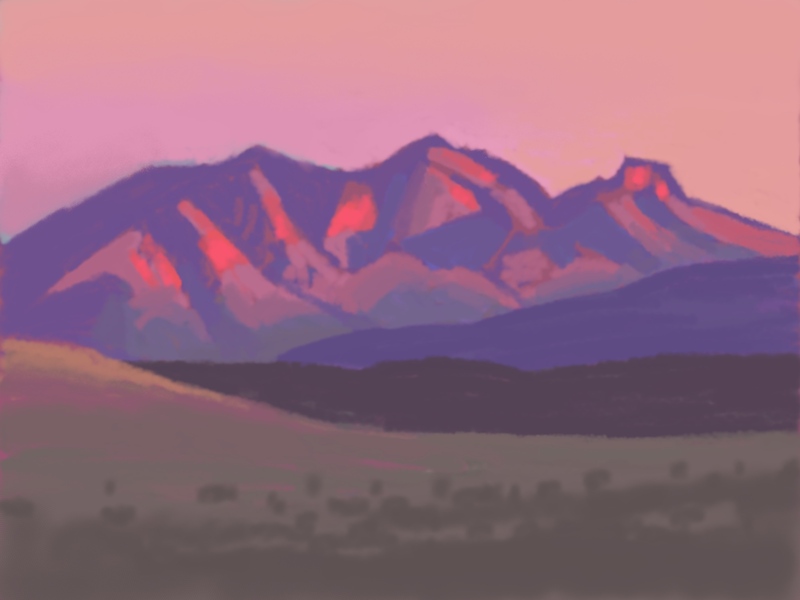 These paintings are basically quick colour sketches, sometimes of fleeting light effects. I hope you enjoy them! Mt. Gillen, Alice Springs, 21 June 2015, 3 pm. 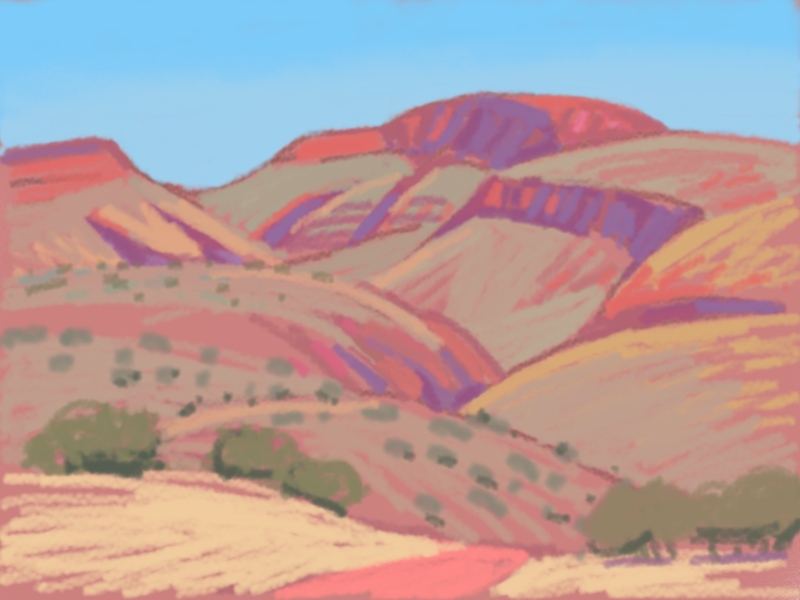 Near Trephina Gorge, East Macdonnell Ranges, 27 June 2015, 3 pm. Last light on the Sundial, Finke Gorge National Park, 29 June 2015, dusk. Mt. Hermannsburg, James Range, 1 July 2015, noon, as seen from Hermannsburg Mission. 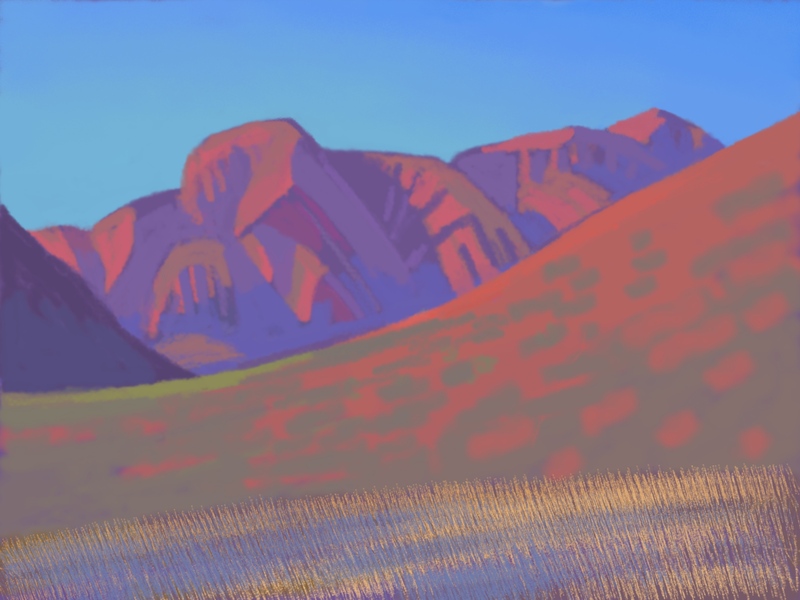 This mountain was a favourite subject of Aboriginal artist Albert Namatjira. 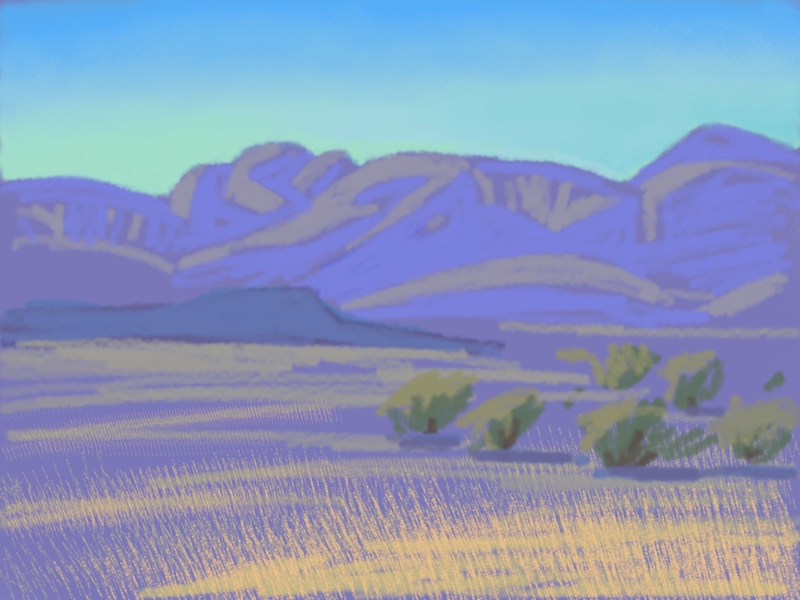 West Macdonnell Ranges, blue light, 1 July 2015, 3 pm. 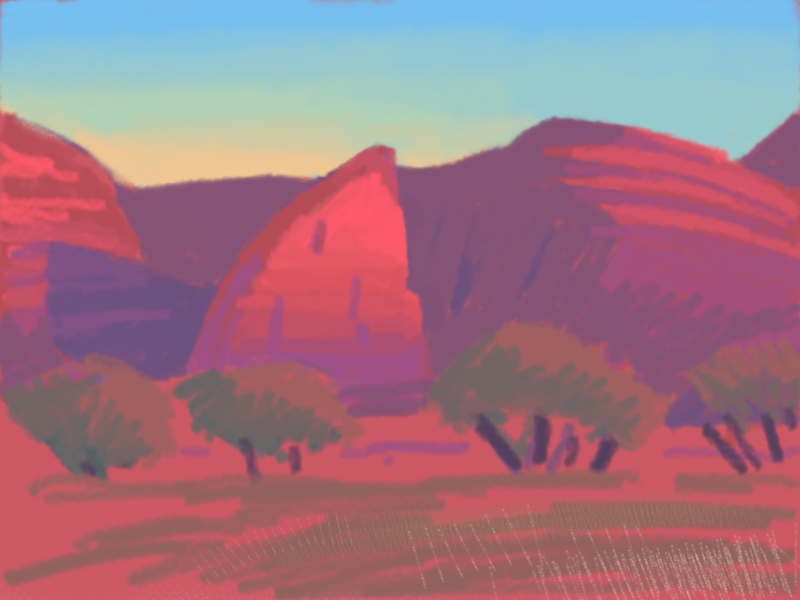 West Macdonnell Ranges, pink light, 2 July 2015, 4 pm. 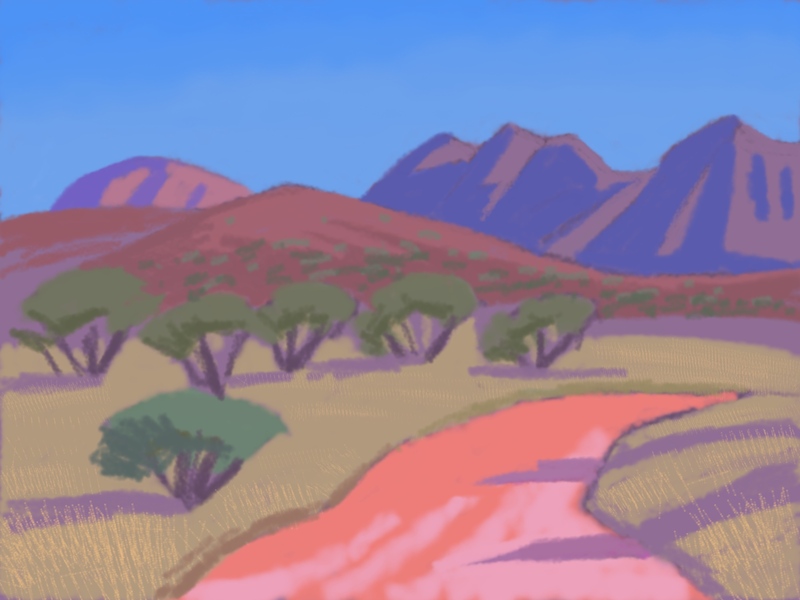 Near Jays Creek, West Macdonnell Ranges, 3 July 2015, 11 am. Mt. 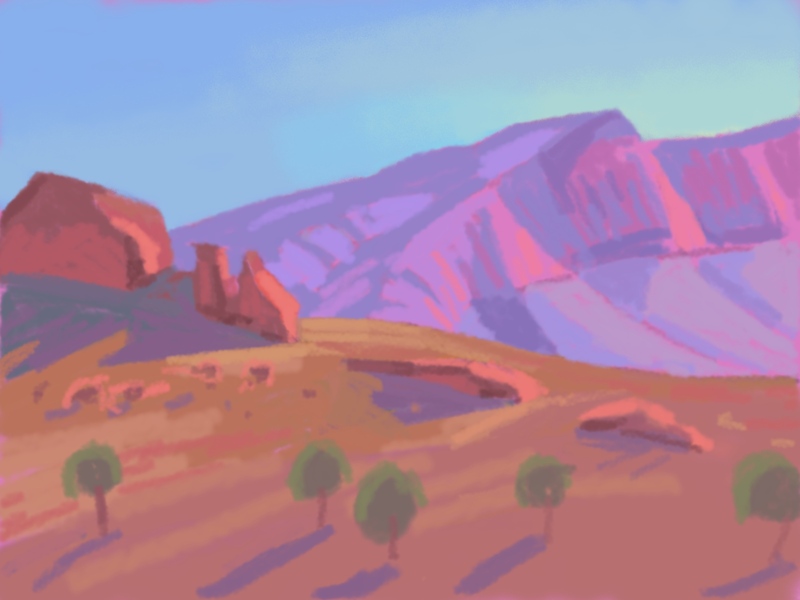 Sonder, blue light, West Macdonnell Ranges, 3 July 2015, 3 pm. Mt. 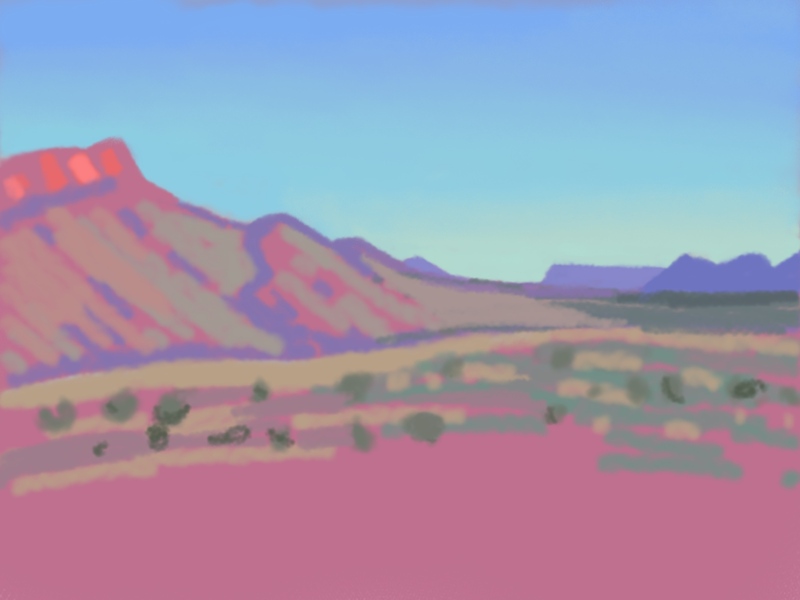 Sonder, dawn, West Macdonnell Ranges, 4 July 2015, 7 am. Glimpse of Mt. 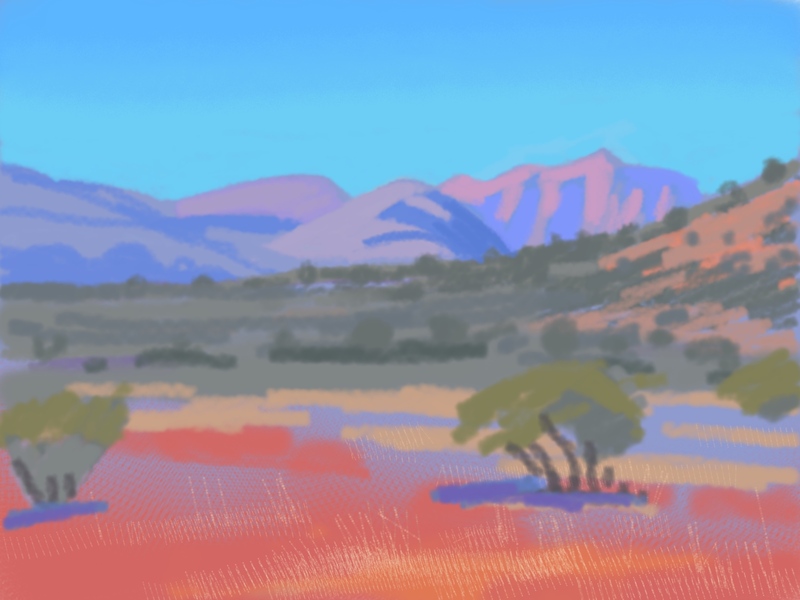 Sonder, West Macdonnell Ranges, 5 July 2015, 10 am. Heavitree Ranges & Ghost Gums near Ormiston Gorge, 3 July 2015, 5 pm. A glimpse of Mt. Giles, part of Ormiston Pound, 7 July 2015, noon. 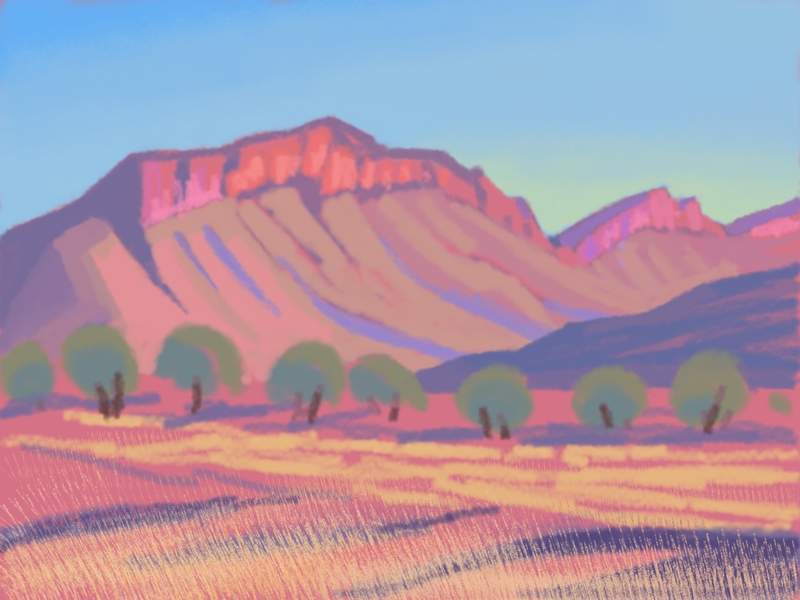 Brinkley’s Bluff, West Macdonnell Ranges, 7 July 2015, 3 pm. This page was created 7 June 2017.